The last thing any parent wants is to buy gifts that will only be shoved aside and forgotten. 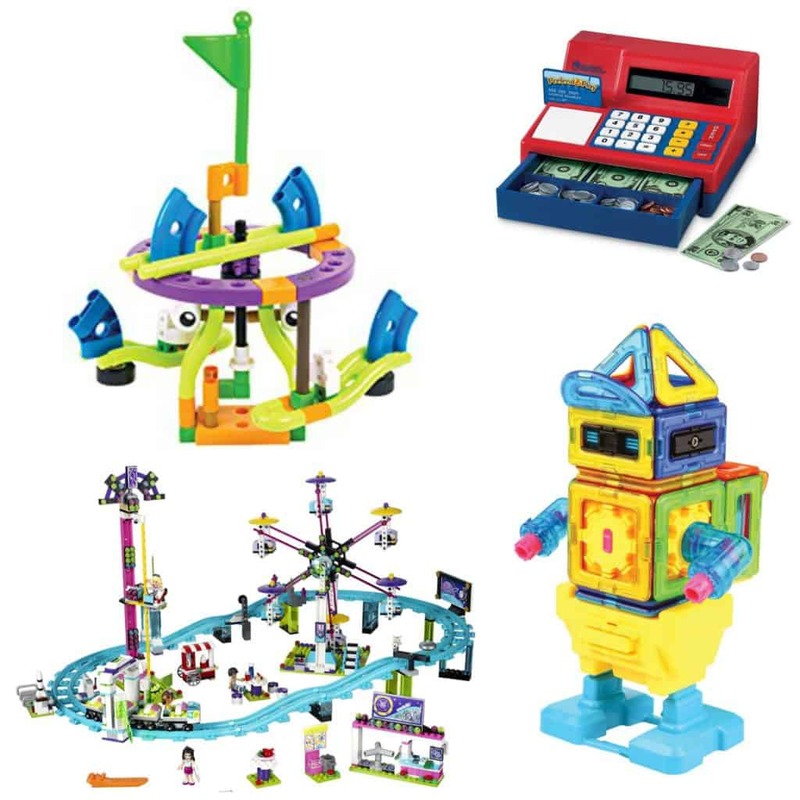 Here you will find the best Christmas gifts for kids. Below you will find play-based learning toy ideas and what aspects of learning they facilitate. My kids’ toys seemingly reproduce overnight. There are toys in every room upstairs, toys in the living room, and toys shoved into the-impossible-to-reach crevices in my car. In an effort to tidy up, I lug what I can down to the basement. There, the copious amount of plastic meets the same fate. Instead of the lower floor becoming the makeshift playroom I’d hoped, it is the place where many toys sit forgotten, collecting dust. We donate. I rotate toys. I’ve asked family members to buy less. But let’s be honest, new toys are still going to make their way into our home. In anticipation of Christmas, LOLs, Hatchimals, and Nerf guns cutouts are glued to construction paper and affixed to our kitchen fridge. And I will indulge my kids to a certain extent. I want to get them a toy or two for Christmas. get value out of their gifts and potentially years of play. Research shows that within the context of play, children use more elaborate vocabulary, problem-solving skills, test out early numeracy (math), and demonstrate skills needed for early literacy (symbolic thought, fine motor skill practice, reading signs and symbols). But… not all toys are created equally. In fact, some toys undermine these benefits. 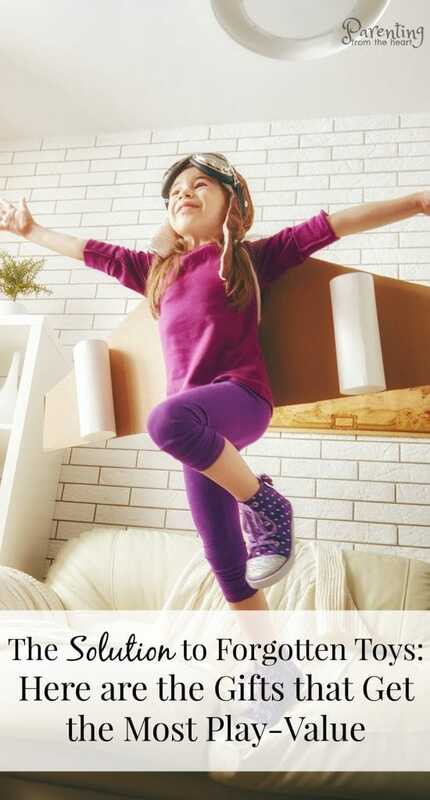 The benefits of play-based learning vast, and so are the ways a parent can help develop facilitate it in the home. What is accessible to children plays a big role in learning through play. 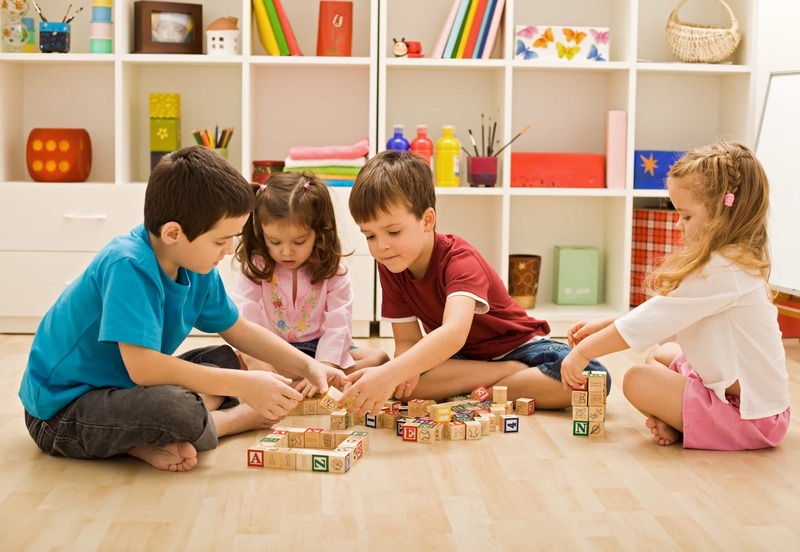 Important elements creating an environment of play-based learning in the home include the structure of children’s day, the amount of time they spend on a tablet or watching TV, the parents’ role, and the types of toys they have. Anything that requires batteries or buttons to get its play-value is typically not a good toy. While brands such as LeapFrog and Vtech have educational content programmed into their toys, these toys aren’t great for early childhood learning. You can procure many of the same benefits by playing children’s songs and providing your child with magnetic letters or manipulatives. Over-scheduling your child’s day takes away from the richness of their childhood. When children have the ability to explore and discover at their own pace, the magic of play-based learning comes to life. Give your child as much free time to play as possible. Having friends over or setting up invitations to play are great. When building on their play, take their lead. When joining in their play, ask the questions about what they’re doing or are learning. If they’re working on numeracy you can remove, two Shopkins and ask how many are left. If they’re playing store, you can ask for a certain amount of money in exchange for an item. Turn off the TV and tablet any chance you get. The less screen time the better. Read more from WebMD here. STEM refers to Science Technology Engineering and Math Learning. Why is STEM learning so darn cool? It promotes innovation, creativity, hypothesis testing and exploration. It has also been found that, in grouping the four together, STEM bridges the gender gap in traditionally more male-oriented learning. Read more here. Because of its open-ended nature, pretend play’s benefits are limitless. Some of the many benefits of pretend play include more complex language use, increased problem-solving skills, better social and emotional understanding, and a stronger imagination. The last one is crucial for early literacy because children start to understand symbolic thought as well as other important elements. To read more, click here. 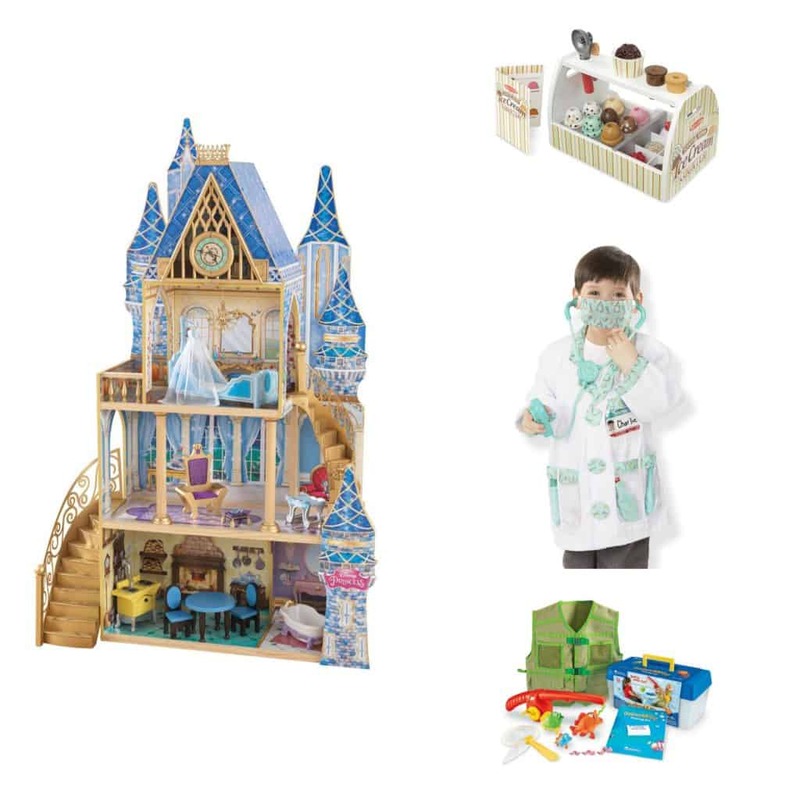 Here are gorgeous pretend play-based learning toys. If you follow my Instagram closely, you will notice I set up activities and encourage my kids to use their fine motor skills. The truth is, fine-motor skills do not come easily to most early learners – my daughter especially. 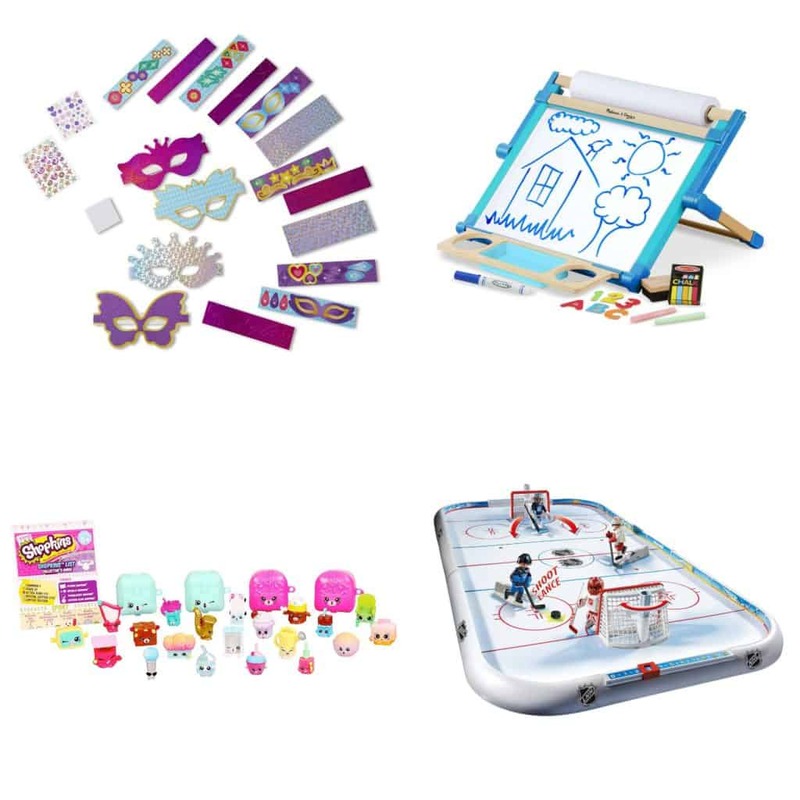 Because fine motor skills are requisites for printing, colouring, cutting, and so much more, I have included toys below that help with hand-eye coordination, writing, and pincer grip. Here are some of my favourite toys to promote fine motor skills. I love kids books, so I could’ve made this list a mile long. Reading increases vocabulary, letter recognition, and your child understanding of the world and their empathy through perspective taking. For more benefits, click here. Here are some of my favourite toys and books to promote language development and literacy. To be active, fit, and burn off energy, children need well-developed gross motor skills. On top of this, there are also innumerable benefits to promoting their development in kids. The development of gross motor skills helps to increase body awareness, sensory processing, muscular strength and endurance, as well as balance, coordination, and so much more. Read more here. 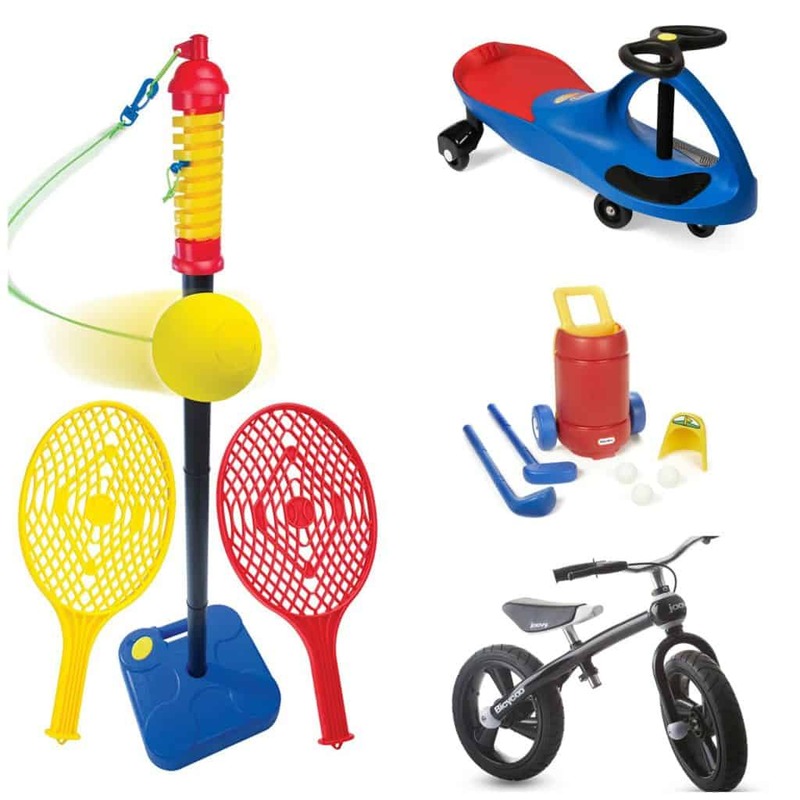 Here are some of the best toys I can recommend for improving gross motor skills. I hope you and yours enjoy these toys as much as I did researching them! I could not agree with this more! I hate it how so many toys these days all have batteries! It leaves no imagination to the child anymore. I don’t know how often I’ll just take the battery out of a toy, because not all toys need batteries! Does a doll really need to talk? Does your playhouse need to talk for them? I completely agree with you that the less noise the toy makes the better it is! Then they learn to really play and use their imagination instead of the toy doing it for them! The toy list that I have for Christmas is centered around toys that use their imagination as well. Some great gift ideas on here that I haven’t seen yet! Thanks for sharing! I totally agree about over scheduling kids! Too many lessons and sports takes away from kids learning how to amuse themselves, shortens their attention span, and I’m absolutely sure limits their creativity and development! Very well said. Obviously there are so many advantages to sports and lessons, but free play to be creative and develop are crucial. I’ve been looking for this, THANK YOU! This is great! We avoid electronic toys as much as possible because they aren’t that great for development and they drive me crazy! We love those wiggle cars for outdoors play and do a lot of pretend play indoors. SO many great ideas here!! We love Melissa and Doug toys! They are so fabulous. 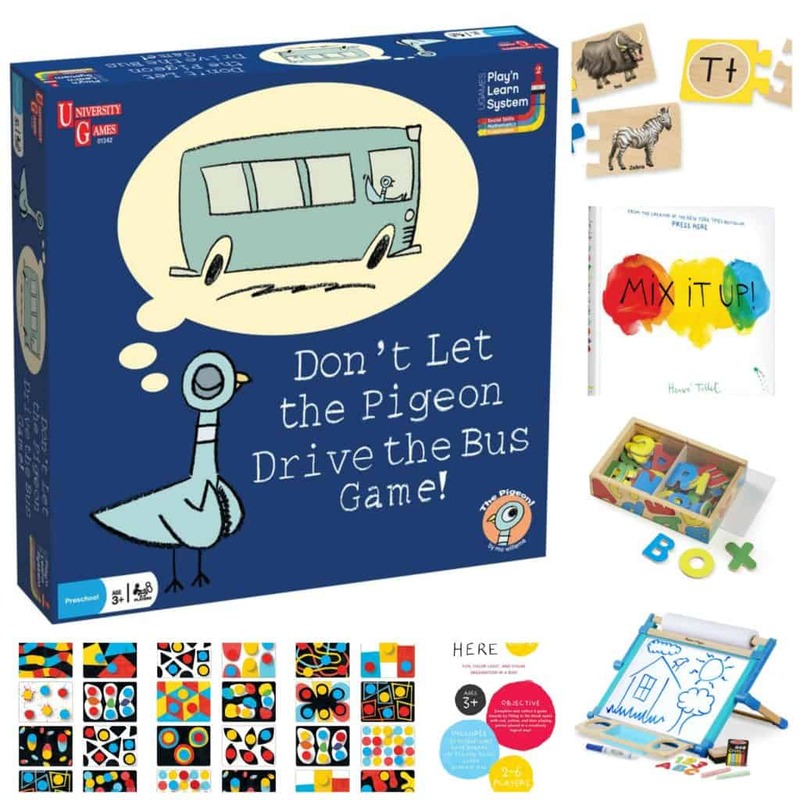 I didn’t know there was a Don’t Let the Pigeon Drive the Bus game! I’m so excited…my kids love Mo Willems and that dang pigeon! Thanks for these great ideas! Yes! Suffice it to say, the moment I saw it existed, I knew I what I was getting my kids for Christmas. We LOVE Mo Willems and that crazy, outspoken pigeon too!. Omg so many great gift ideas!!! My daughter is obsessed with Melissa and Doug!!! Isn’t Melissa and Doug awesome? It’s so great for play-based learning!